I believe anyone can accomplish anything. It’s the person themselves that say they can’t. Everyone learns, thinks & responds to information differently. The common factor is either keep moving forward or stop and say I can’t. It’s up to what that person really wants. 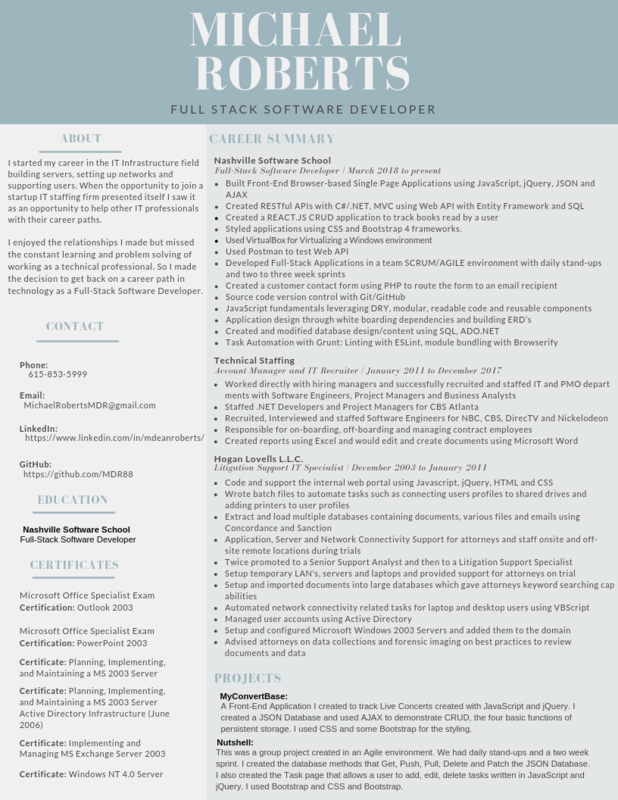 I am a Full Stack Software Developer and all though my experience is with C# .NET on the Back-End I am open to learning any language or technology to create and solve business problems. I'm also a musician and love music history. I play guitar, bass and piano when I can. Music has always been a big part of my life. When I dove deep into Software Development It made me a better musician. I started to see music much like code. As difficult as learning new code coould be, you have to do it to learn in. Much like a guitar, you can learn about the theory, but without playing it you will never truly learn it. Coding has made me more disciplined and focused. Coding is now as important to me as music. Feel free to reach out! I would like to hear from you. © Copyright Mikedroberts.com All rights reserved.